Featured Artwork: Roger Shimomura, The Lineup, 2006, acrylic on canvas, 36 × 72 inches. 2018 Collectors’ Circle purchase. ASHEVILLE–The Asheville Art Museum’s Collectors’ Circle selected 12 works to add to the Collection at their 15th Annual Year-End Acquisition Dinner at Céline & Company “On Broadway” on December 12, 2018. The Museum’s Collectors’ Circle supports the proactive development, stewardship, and conservation of the Museum’s Collection. Over the years, the Circle and its members have purchased over 160 works of art in all media for enjoyment by the Asheville community and its many visitors. The Museum thanks all members of the Collectors’ Circle past and present. This year’s choices consist of art from a diverse array of perspectives produced in a variety of media, further informing the Museum’s educational initiatives and collecting priorities. The Circle’s 2018 acquisitions include works from artists sharing their experiences as people of color in the United States. Gina Adams is a descendant of both indigenous (Ojibwe) and colonial Americans. Her work The Treaty with the Cherokee 1794 Broken Treaty Quilt, part of her larger Broken Treaty Quilt Series, takes as its subject matter the numerous treaties entered into with Native American tribes, the terms of which were subsequently broken by the U.S. government. 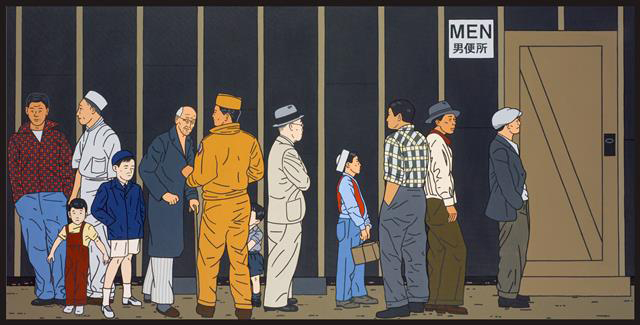 Likewise, Roger Shimomura’s The Lineup depicts 12 men of varying ages waiting in line for the restroom. This powerful painting on canvas draws from his experience as a Japanese American imprisoned at the Minidoka War Relocation Center during the Second World War. The Museum was pleased to collaborate with the following galleries and artists to bring this year’s works of art before the Collectors’ Circle and into the Collection: Accola Griefen Fine Art (Brooklyn, NY), Conrad Graeber Fine Art (Riderwood, MD), DC Moore Gallery (New York, NY), Keith Sheridan Fine Art (Myrtle Beach, SC), Ferrin Contemporary (North Adams, MA), Matt Jones (Leicester, NC), Paramour Fine Arts (Franklin, MI), Roger Shimomura (Lawrence, KS), and Tracey Morgan Gallery (Asheville, NC). Gina Adams, The Treaty with the Cherokee 1794 Broken Treaty Quilt, 2015, hand-cut calico letters on antique quilt (double-sided), 79 × 80 inches. 2018 Collectors’ Circle Purchase. Jade Doskow, Montreal 1967 World’s Fair, “Man and His World,” Buckminster Fuller’s Geodesic Dome with Solar Experimental House, 2012, archival pigment print on paper, edition 3/5, 40 × 50 inches. Museum purchase with funds provided by 2018 Collectors’ Circle Member Vito Lenoci and the Lenoci Family in honor of the Nat C. Myers Fund for Photography. Jade Doskow, New York 1964 World’s Fair, “Peace Through Understanding,” New York State Pavilion (Fresh Paint), 2017, archival pigment print on paper, edition 1/5, 40 × 50 inches. Museum purchase with funds provided by the Nat C. Myers Fund for Photography. Dorothy Hafner, Kyoto Homage tea set, 1980, porcelain, slip cast, engobe decoration, clear cover glaze; teapot: 8 ½ × 10 ¼ × 4 ¼ inches. Museum purchase with funds provided by 2018 Collectors’ Circle Members Nancy Crosby and Fran Myers. Helen West Heller, Cider Press, 1939, woodcut on paper, edition of 80, 5 ½ × 11 ¼ inches. Museum purchase with funds provided by 2018 Collectors’ Circle Member Lyn McFarland. Helen Hyde, Mount Orizaba from Jalapa, Mexico, 1912, color woodcut on Japanese paper, edition unstated, image: 9 ¾ × 9 inches. Museum purchase with funds provided by 2018 Collectors’ Circle Member Gary Anderson. Gwendolyn Knight Lawrence, Girl, 2004, screenprint on paper, edition 17/75, 17 × 15 ⅞ inches. 2018 Collectors’ Circle purchase. Dorothy P. Lathrop, Kou Hsiung, 1944, wood engraving on paper, edition of 200, image: 6 × 6 ⅛ inches. Museum purchase with funds provided by an anonymous 2018 Collectors’ Circle Member. Roger Shimomura, The Lineup, 2006, acrylic on canvas, 36 × 72 inches. 2018 Collectors’ Circle purchase. Museum purchase with funds provided by 2018 Collectors’ Circle Members Susan Holden and Gary & Olivia Zahler. Matt Jones, Within You Without You, 2018, stoneware with wood-fired alkaline glaze, height: 30 ¼ inches. Museum purchase with funds provided by 2018 Collectors’ Circle Members Jon & Ann Kemske and Brian & Gail McCarthy. John Sloan, The Movey Troupe, 1920, etching on paper, edition of 100 (50 printed), image: 5 ¼ × 7 ⅞ inches. Museum purchase with funds provided by 2018 Collectors’ Circle Members Russell & Ladene Newton in memory of Nancy Albyn. 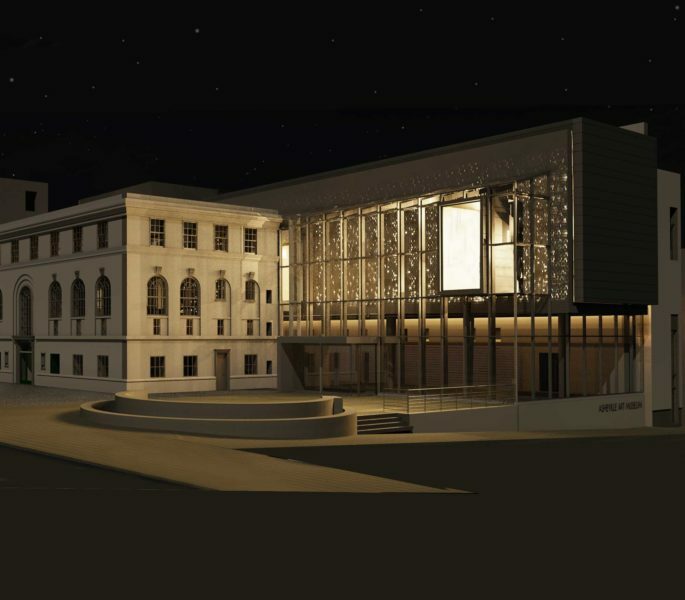 The Museum looks forward to sharing these new additions with the community of Western North Carolina and regional visitors upon the Museum’s reopening. For more information about Collectors’ Circle or Circle membership, please click here.